Are you performing due diligence on Hangzhou Yintex Co Ltd from Zhejiang China who sells Bedding? If so, you may want to read the below review of the experience of one buyer and their recommendation to consider when dealing with this company. 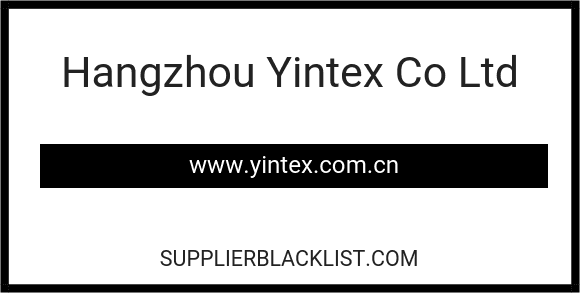 You will also find some links to help you find more related information about Hangzhou Yintex Co Ltd on Supplier Blacklist and on Google as well as other bad suppliers of Bedding reported here on SBL. We placed order with Hangzhou Yintex Co Ltd with a hard must ship by date for a dated event…Contacted them over and over confirming the ship date. They never replied after numerous of emails and phone calls. Once they replied and via phone they stated they would air freight the order, but once the air freight cost was to expensive they started making excuses. We sent over 40 emails and calls with no reply or call backs. We requested to cancel the order and to please refund the deposit, but they did not cancel or send back the deposit even after the owner confirmed via Email our deposit would be return. Its been over 90 days and Hangzhou Yintex Co., Ltd. has not returned the deposit and over 30 days since the owner has replied to Emails and Phone calls. Do not use or do business with this factory! Need More Info on Hangzhou Yintex Co Ltd? If you need more information, you can click the below links to search for more submissions about Hangzhou Yintex Co Ltd on Supplier Blacklist as well as go to the search results page on Google for more reviews online about this company. Perform a Supplier Blacklist search for more reviews on Hangzhou Yintex Co Ltd.
Search Google for Hangzhou Yintex Co Ltd Reviews.